where the times are ti and the responses are yi,i=1,…,n. The sum of squared errors is the objective function. Usually, you have data from measurements. For this example, create artificial data based on a model with A=40 and λ=0.5, with normally distributed pseudorandom errors. Write a function that accepts parameters A and lambda and data tdata and ydata, and returns the sum of squared errors for the model y(t). Put all the variables to optimize (A and lambda) in a single vector variable (x). For more information, see Minimizing Functions of Several Variables. Save this objective function as a file named sseval.m on your MATLAB® path. For information about including extra parameters such as tdata and ydata, see Parameterizing Functions. Start from a random positive set of parameters x0, and have fminsearch find the parameters that minimize the objective function. The result bestx is reasonably near the parameters that generated the data, A = 40 and lambda = 0.5. 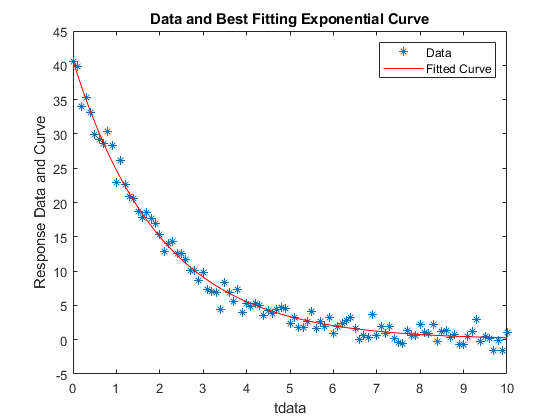 To check the quality of the fit, plot the data and the resulting fitted response curve. Create the response curve from the returned parameters of your model.